Welcome to the festive edition of Random Thursday! 2. On the flip side, the police weren’t fans of Santa in Dundee recently, when he fled the scene of a car crash. Obviously a Nissan Micra doesn’t handle the same as the reindeer! 5. And finally, the shopping centre across the road from my office made the news at the weekend when a flashmob helped one of the locals propose to his girlfriend. That was brave, stopping Christmas shopping like that! 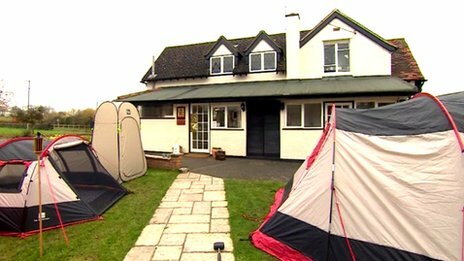 I wouldn't like to be the person assigned to the vertical tent near the steps 🙂 and is now a good time to tell you that we will be having rhubarb and custard for pud on Christmas Day with Victoria sponge to nibble with our cups of tea afterwards? My conscience has been smitten by all that alcohol we exposed you to! We add a boozy tiramisu into the holiday mix too. It is our Christmas Eve desert. A booze free Christmas cake would be laughed off our table!!! And I would have killed my husband if he would have proposed like!! I survived the brandy Christmas cakes too! Tea fruit cake is for all the other days of the year! How many kids eat cake and drive under the influence. I ask you. D-I-C a handheld console maybe! Party pooper recipe! I'm grabbing on to #4. Oh for goodness sake folks. Most of use survived our childhoods and alcohol drinking and smoking mothers, seems like a little libated fruit cake never hurt anyone. But then maybe that's how our kids got grown…..we medicated them. Er something like that. Cute idea but what if she said NO! For crying out loud everything is getting way too politically correct. Everyone knows that when you cook booze all the alcohol is cooked out…meddlesome do gooders. Fruit soaked in tea? I'm gagging a little. Great post. That is just ridiculous, the tea soaked fruit that is. Who didn't have booze soaked plum pudding, Christmas cake as kids and we all turned out perfectly fine, umm, most of us! I don't think the fiancé to be looks really impressed, maybe she was camera shy, but she kind of looked a bit hesitant. What if she had said no, awkward! I'm not sure if that bride to be is embarrassed or a tad reluctant?? Me thinks the latter! Great festive edition and I'm so with you on the Christmas cake/brandy butter thing!! As far as I am aware, bread made with sultanas and currants soaked in tea is called Brack. It's nowt like Christmas cake either. God forbid the czech police should do any work ! my dad used to make that cake when we were young. Not for Christmas, just as a cake. He called it a cuppatea cake. clearly it's no good for christmas! The whole not giving brandy-laced goodies to kids sounds like an idea right at home with America's Puritanical roots lol! Maybe that's why we don't have Christmas cake, just non-alcoholic fruit cake? 😉 Alas there was that one time when we had prohibition too. I think we probably lost a lot of great things during that period (like all the amazing small, local breweries for instance). have done the tea soaked loaf but not at Christmas – silly notion. I like a good Tea Brack, but it is a very poor substitute for a brandy soaked Christmas cake ! The childhood brandy could explain quite a bit :). Happy holidays! My mum was told by the doctor to have a brandy before the final feeding of the baby – and I followed that advice too. I can report that all babies slept through the night from an early age !!! !